Since Shooter Jennings is the son of Waylon Jennings, I expected this to be all country. That’s certainly far from true. Yes, there is some country here, and it’s quite strong. There are plenty of other things here, too. 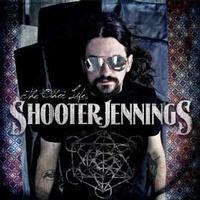 All in all, this is quite an entertaining and vital disc and I’d really love to hear more from Shooter Jennings. He seems really talented, creative and interesting. The early sections of this are made up of a piano solo that is quite pretty. It’s dramatic and rather classical in nature. It works out later to a piece of psychedelic music that’s part Beatles and part Pink Floyd. It’s about three minutes in before the first real vocals (there was a little bit of vocals earlier) enter. The music is more stripped back under the vocals and this is really very much a psychedelic rocker. There is still a bit of that psychedelic rock or pop element in place here. Overall, this is more of a bluesy jam. It’s got some country music, as one might expect, but it’s far less about that and more about good time Americana. The first section of this is in the form of a stripped down, acoustic guitar driven country ballad. It fires out after a time to some killer hillbilly country. There is still a bit of a psychedelic vibe over the top of this thing, though. It’s a great tune. It’s definitely one of the highlights of the set. There was a time in the early to mid 1970s when soft rock had a lot of country influence built into it. This song would have really fit in well in those days. Sure, it’s really more country than anything else (and I love some of the pedal steel guitar on this) but it wouldn’t have been out of place on an Eagles album. Yes, I know they are considered country in some circles today, but that’s really my point. This tune rocks out a lot more. It’s very much in the modern hard rocking sort of modern country style. I really like this a lot. It’s catchy and just plain cool. It’s one of the highlights of the set. A pure country ballad, this is a good tune, but not really a standout. This one is more of a country rocker and it’s very cool. Continuing with some more rocking country sounds there are some intriguing flavors here. The vocals really showcase the rock side of this number. There are even a couple cool little synthesizer solos on this thing. This cut is also, apparently built for live performance as there's a call and response audience participation section built into it. This down-home tune has a rocking backbeat, but otherwise is sort of country folk tune. It’s quite catchy and quite cool. It’s really one of the standouts of the set. The guest vocals on this really remind me of Axl Rose. Of course, since Jim Dandy is the lead singer of Black Oak Arkansas, I wonder if Rose was a fan. I haven’t heard that band in ages, and I really need to check them out again. This is a great rocker that’s more on that end of the spectrum than it is on the country end. Sure there is some country here, but this is more along the lines of Southern rock. This is definitely a highlight of the set. This is basically a country power ballad at least at first. It should be said that it is angry and definitely receives a serious parental advisory in terms of the lyrics. It’s a great tune and another highlight of the disc. Later in the piece it works out to a killer jam that’s part space rock, part jazz and all cool. It’s an intriguing and unexpected turn.